We present QUARC, a framework for the optimized compilation of domain-specific extensions to C++. Driven by needs for programmer productivity and portable performance for lattice QCD, the framework focuses on stencil-like computations on arrays with an arbitrary number of dimensions. QUARC uses a template meta-programming front end to define a high-level array language. Unlike approaches that generate scalarized loop nests in the front end, the instantiation of QUARC templates retains high-level abstraction suitable for optimization at the object (array) level. 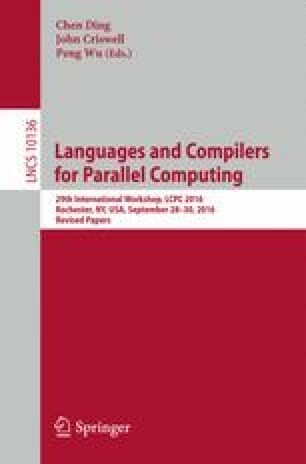 The back end compiler (CLANG/LLVM) is extended to implement array transformations such as transposition, reshaping, and partitioning for parallelism and for memory locality prior to scalarization. We present the design and implementation. This work was supported in part by the DOE Office of Science SciDAC program on grants DE-FG02-11ER26050/DE-SC0006925 and DE-SC0008706.